Airbags are one of the most important safety features of your car and one should always ensure that they are in fully working condition. Research suggests that the front airbags have saved over 40,000 lives since they were introduced back in the 1970s. In case of an accident or collision, the front airbags play their major role in protecting the driver from any head injury and even other parts of the body. However, a lot of drivers have complained that the airbag light in their car starts to blink without any reason and it is often ignored. This leaves the driver at serious risk in case the car experiences a collision and the airbags do not engage. In this article, we will discuss some of the common symptoms you might face when the airbag sensor becomes faulty and starts to malfunction. Airbag sensors are also known as crash sensors and depending on your vehicle model and make, they are located everywhere in the car. These sensors detect a collision and cause the airbags to engage. These sensors are usually located at the front to detect the frontal collision and on the sides to detect a side impact. In modern cars, there are multiple sensors depending on how many airbags are offered. What is an airbag sensor? The sensor is basically a detecting device that can read rapid deacceleration of the vehicle and generates a signal as a response. Its basic function is to electronically communicate the information with the Electronic control unit and all the equipment related to the airbag system. The intensity of the collision is also noted and it is used to determine whether or not the airbag should inflate. These sensors can be classified into two main kinds. First one is the mass-type sensor. This is usually deployed in the front of the vehicle to measure a noticeable impact. It usually contains two sensors, one of which is inside the engine while the other one is installed in the area of passenger seating. The sensor is capable of distinguishing dangerous collisions from non-dangerous collisions and generates information to calculate when exactly the airbag should inflate. The core principle of it’s working it to detect the deacceleration of a vehicle in motion as well as its intensity. The second type of sensor is called the roller-type sensor. 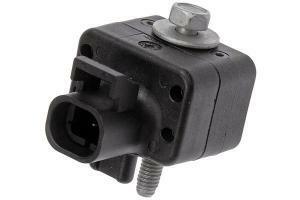 This sensor usually consists of a coil spring component which is connected with some weight. Once the vehicle hits an object and impact is generated, the weight it pushed in the opposite direction and the coil spring experiences a tension. This tension and the movement in the coil spring is capable of recording the intensity and consequently generates an electrical signal to the circuit. As soon as the driver puts in the key and starts the car, the airbag control module tests the airbag sensor circuit and see if it is working properly. You will also see the airbag warning light illuminate on the dashboard whenever you start the car indicating that the sensor is working fine. However, if the light stays on after the car has started, it means that a problem exists. The most common symptoms you will realise is that you airbag light is flashing or lightened up on your dashboard. This means that the airbag function is disabled. Sometimes the airbag warning light will flash in a specific pattern, for example, if the light blinks twice then pauses and then blinks three times continually, it is indicating code “23”. You can refer to your vehicle manual and find out more about this particular code. The best way to check the airbag sensors is through a diagnostic scan tool. Take your car to a professional who will use the tool to exactly find out what is causing the problem. Make sure to not use a multimeter while testing the airbags or you would end deploying them. If your vehicle’s battery was recently drained, chances are that the airbag battery backup was depleted as well causing the light to flash in the dashboard. The problem can easily go away if you fully recharge the car battery again. However, you would still need to remove the soft-code error with the diagnostic tool. The airbag clock spring maintains the consistency between the airbag and the electrical wiring by continually interweaving in and out against the steering wheel. The circuit bands may begin to wear out after some time and can cause the airbag system to register a code error. This will, in turn, cause the airbag light to flash in the dashboard. The clock spring problem is difficult to diagnose at home, so you need to take your car to an automotive specialist who will use a diagnostic tool to determine the root cause. If the problem is found with the clock spring, they would have to been replaced. The airbag module tends to get damaged over the time. It can be found under the driver seat or the front passenger seat. If the airbag module gets exposed to water or even light moisture it starts to corrode and results in a short circuit. When the module is shorted out, a DTC code is generated causing the airbag light to flash in the dashboard. Where is the airbag sensor located? The location of the airbag sensor is highly variable and depends a lot on the vehicle design. The best way to go about finding the location of the airbag sensor in your vehicle is to refer to the service manual provided by your manufacturer. Usually, it is located behind the front fascia, which is the front bumper. It can also be located by the condenser. Certain designs would have an airbag sensor inside the engine while another one anywhere in the area where the passenger seat is present. For some vehicles, the airbag sensors may be located throughout the vehicle. They are also commonly found behind the front fender in the front of the vehicle. In most cases, you have to use an OBD2 scanner to reset the ABS control module‘s trouble codes. A lot of times, the vehicle’s onboard computer does weird things and you might see random lights flashing on the dashboard. Open the hood of your car and locate the battery. On the battery, you would see a positive and a negative terminal. Using a socket wrench, unscrew the nut on negative terminal and remove the cable clamp completely. After the clamp is removed, wait for at least five seconds then reconnect the negative terminal. This simple process resets all the sensors in your car and you will most likely see that the airbag light has stopped flashing. Replacing a failing airbag sensor can be a very sensitive business and that is why you need to get a little into practice after exercising a few things before getting started on this. Also, it’s highly recommended to follow the manufacturer’s service manual on this before getting started to know how the design of your vehicle would allow you to replace it. Here are a few steps that you should consider while replacing a bad airbag sensor. Retrieve all the things you would need for a replacement. After disconnecting the battery or any other power source, wait for at least 3 minutes before starting and preferably a little longer. Disconnect the 4P connectors from the driver and passenger side sensors for replacing the front impact sensors. Connect the connectors back to the original ports. The diagnosis of airbag sensor would require you to consider certain things. First of all, you will be alerted by the airbag control module when you start your car. If the airbag sensor circuits are not accurate and in order, you will be given an indication on your dashboard with the airbag warning light being illuminated. This is a useful indication of something being wrong with your system. The light may flash instead of just being lit, which could be a code that you can refer to in the user manual provided by your manufacturer. The light may flash once, twice, or multiple times. It may also pause between flashes. These signals will help you understand what exactly the problem is and where. Unlike other sensors, it is usually not recommended to check the airbag sensor with a multimeter probing. The multimeter can induce the circuit and the airbags can come out unnecessarily which can cost you as much as $3000 or more. Other obvious signs of a bad or failed airbag sensor are airbag not working during a hard collision. For some vehicles, you would need to replace the sensor along with the other components after a collision, while for others you don’t need to replace it. 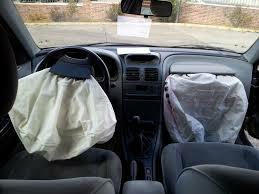 Any repairs to the airbag system should be done by an expert. If you love fixing your car yourself, you can easily replace a faulty airbag sensor at home. However, some important precautions have to be taken such as depowering the airbag system. To do this, disconnect the car battery and leave the headlights on to exhaust any remaining battery power. Once the power is completely out, wait for about 15 minutes since the airbag sensors are designed to deploy even when the car loses its power. Once you are sure that the airbags won’t deploy, disconnect the sensor and install a new one. The location of the sensor varies from car to car, so you would have to refer the car’s manual in order to find the location of a particular sensor. You might also have to remove the front fender and side door panels. after a replacement of the airbag sensor. The airbag sensor is a sensitive component, and so is the replacement. This can take as long as 2 hours even for a professional to properly diagnose and install the airbag sensor. The parts are usually not expensive at all. However, the process of replacing it can be highly critical, which is why it can cost relatively a lot more in terms of labor. Therefore, the average cost for replacing an airbag sensor for most vehicles can range anywhere between $250 to as much as $350 depending on the type of the vehicle, the design, and other such factors. It is usually recommended to get it fixed by an expert mechanic. However, you can also do it yourself at home and save up on the labor cost significantly. Depending on the type of the vehicle, the price for the impact sensor or the airbag sensor could be anywhere starting from $45 and going all the way up to $281. It’s recommended doing market research before getting it fixed. 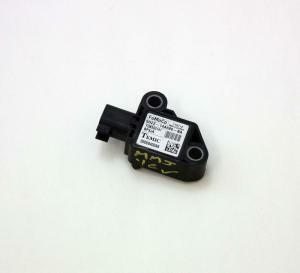 Where can I find the signalling description between the ECU and airbag sensor bosch 0285003001?